This little guy surprised me. the FP 71HTA made strong power. temps were around 65F during the runs in Canada. The owner Jean, said the gasoline they get over there is more so equiv to 94oct in the usa, so just thought i'd note that also. cars a track / road course car, so we are doing two tunes here. the one i just showed is a road tune for him to enjoy the car on the public street. The 2nd tune i did not post yet. That tune will have the boost turned down to around 24psi and we will richen the afr just a tad + we will enable the methanol for cooling the intake charge even further. The meth won't exactly be fully taken advantage of in this situation, it is more so like just turning it on to give the car a little extra security. Just like someone that would mix some race gas in with their regular gas for example to up the octane to assure they don't get knock during an long endurance event. Will share that graph once i finish that tune. Tom do you think the turbo will make 470 with meth ? I am really interested in this thread I have similar mods. Hi guys! This is my car. And because of tom, it push so hard!!! And it run really well, power start at 3500 rpm and never stop pushing! This is exactly what i want, thanks to tscomp. I don't want to push the car to max power because in the beginning of the year, i blow a bottom end... I know there is there is really low risk now that i had a real tuner... But im still scared so until i forged the motor, i don't want to push the car to hard. We have big winter here, so road course season last only 5 month, its why next year we will push this setup to his limits. Thanks again tom for everything. If we just added the meth in with where the tune currently sat on the straight 93 with this high boost, then yes i believe so its very possible. however we dropped boost down to 24psi for the meth, so i dont think that is do able at 24psi. ill give it a shot though. we are seeing how much we can make at just 24psi with the meth for fun, (not the actual road course tune). that will be left very conservative with extreme safety in mind. I will post what it makes on the meth with low boost though once finished. Thats a good setup. kelford and the s2 are all but identical in performance. s2 with the slight edge. Thank you Jean! I'm very interested to see what it makes on the meth in low boost. In for results!! Just picked up a 71hta, this is looking promising! Wonder if the 71 and a 2.3/e85 could break the 500 mark..
Last edited by 211ratsbud; Jun 16, 2013 at 05:39 PM. This turbo looks promising and the best part is it is very affordable compared to others out there! I have WMI too so I'm interested to see what it'll do on 24 psi with meth. Solid results! How's the HTA71 compare to the BBK Lite? Well i have 2.3 with S2's and HTA Green for AutoX the car is little bit slow at low rpm the IX and HTA71 Turbo is very good for tracks. it depend how you want your car to be,i see the IX and HTA71/HKS GTII is best turbo to perform for track days but for drag and street racing nothing less than green/red/black. I wouldn't consider it a bandaid if cams and e85 solve the power dropoff..
it would feel like k03's on a 2.7, undersized. Just personal preference. To each his own. Btw, there are a few e85 results for 71hta's by Tom here, search "71hta" title only. 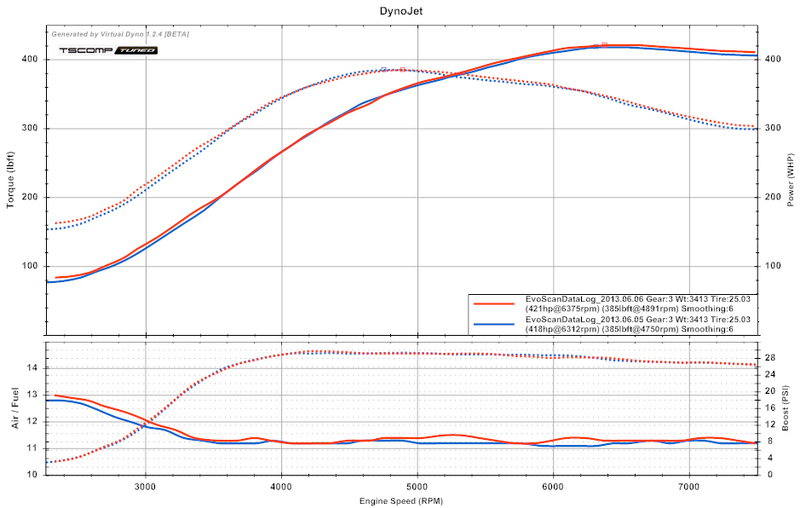 at 24psi it made 400whp so far with a lot less torque. were not done yet. his throttle body seals are leaking or some seal went bad in the throttle body area so we stopped. whenever we resume and i complete it i will share it.